British Prime Minister Theresa May speaking this afternoon. BRITISH PRIME MINISTER Theresa May has said undoing any of the progress made in Northern Ireland in recent years would be “an absolute horror”. Speaking in Belfast this afternoon, May said she remains committed to the Good Friday Agreement and against a hard border returning between the North and the Republic of Ireland. May said her commitment to preventing a hard border is “unshakeable”. Sinn Féin leader Mary Lou McDonald was critical of May’s speech, saying she and the Conservative Party have put the “demands of Brexiteers” above the needs of people in Ireland – north and south. A spokesperson for the Irish government was more positive about the speech, but raised concerns about “unrealistic expectations regarding what can be achieved” in relation to the backstop element of the draft Withdrawal Agreement. In her speech, May said she was 12 years old when the Troubles in Northern Ireland began and was 41 when the Good Friday Agreement, also known as the Belfast Agreement, was signed in 1998. She said violence has not been eliminated in the North but has been reduced to levels not deemed possible in the past. She said she is committed to getting the Northern Ireland Executive back up and running – over two years after it collapsed in January 2017. May said undoing the progress made by political parties and members of the public alike would be “an absolute horror”. She added that she wants to keep working with people from across the political divide to further strengthen the relationship between the UK, Northern Ireland and the Republic. “I want to work closely with Taoiseach Leo Varadkar and the Irish government to strengthen the bilateral relationship we have built,” she said. May spoke about the shared history of the UK and Ireland, and cited the inclusive way the Easter Rising centenary was commemorated as an indicator of how far relations have progressed in recent years. She also described a joint bid by the UK and Ireland to host the 2030 football World Cup as “tantalising”. May said Britain leaving the European Union poses “unique challenges” to Northern Ireland and she knows people living there and in the Republic are understandably “anxious” about the outcome of Brexit – as it is there many of its effects will be most keenly felt. 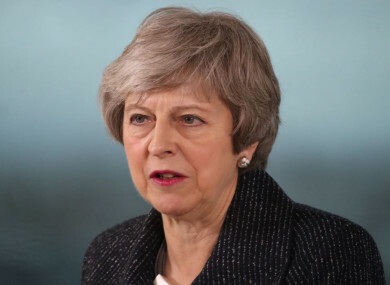 She said the backstop element of the draft Withdrawal Agreement struck between her government and the EU was needed as an “insurance policy” to guarantee no return to a hard border in the event of a deal not being reached before the official withdrawal date of 29 March. May said she “fought hard to make the case for the deal as it stands” but has accepted that Members of Parliament will not back it unless legal assurances are made in terms in of the backstop. The deal was rejected in the House of Commons by 432 votes to 202 last month. Many politicians have raised concerns about the backstop, which aims to avoid a hard border between the Republic and Northern Ireland and could see the North stay aligned to some EU rules. Last week, a majority of the House of Commons voted in favour of an amendment that proposes replacing the backstop with unspecified “alternative arrangements”. The Brady Amendment garnered the support of 317 MPs, with 310 voting against it. In a statement released this evening, McDonald said May’s speech was a “step backwards” and “full of old rhetoric and no solutions”. “Last week in Westminster, Theresa May effectively binned the Withdrawal Agreement that she negotiated,” the Sinn Féin leader said. For the Tory party, the demands of the Brexiteers rank above the needs of the people and economy of Ireland, north and south. McDonald noted that a majority of people in Northern Ireland voted to remain in the EU (55.8%), saying May “does not speak for the people of the North in relation to Brexit”. “The Good Friday Agreement must be protected in all of its parts. And in the event of a hardening of the border, the people of Ireland must be given the opportunity to remove it through an Irish unity referendum,” she said. McDonald and other Sinn Féin representatives are due to meet May in Stormont tomorrow. A spokesperson for the Irish government welcomed May restating her commitment to avoiding a hard border. “Her statement about the need to recognise shared identities in Northern Ireland was especially welcome,” they noted. However, the spokesperson added that the government still has “concerns about unrealistic expectations regarding what can be achieved regarding the backstop”. “The EU position is clear and not for changing. There is scope to adjust the political declaration but not the Withdrawal Agreement,” they said. Former First Minister of Northern Ireland David Trimble is planning to take the British government to court over the backstop – claiming it would undermine the Good Friday Agreement by imposing a ‘top-down’ bureaucratic structure on the island of Ireland. A spokesperson for the former Ulster Unionist Party leader, now a member of the House of Lords, said last night that he planned to initiate judicial review proceedings to ensure that the backstop protocol “is removed from the Withdrawal Agreement”. Speaking to BBC Radio 4′s Today programme Trimble said he was concerned at the way the agreement “turns the Belfast Agreement on its head”. “The bit of the agreement you have to handle with care is cross-border arrangements, and we have to do that successfully. But the EU has come in and in this exit agreement that they negotiated, they, in the process of that, stripped out a number of competencies out of the devolved administration, out of the Belfast Agreement and put in place a number of top-down structures. Trimble, who received the Nobel Peace Prize alongside SDLP leader John Hume for his work on the 1998 agreement, said that the backstop had originated as a result of fears in Brussels that “Ireland could become a back door whereby goods that don’t meet their regulatory standards come in”. Speaking today, May noted that the Good Friday Agreement enshrines the “consent” principle whereby Irish people have their say over any constitutional changes, adding that this will ”forever be honoured” by the British government. Varadkar and his EU counterparts have repeatedly said the Brexit deal cannot be renegotiated. The Taoiseach previously said a proposal for Stormont to have a veto over conditions attached to the backstop would not be acceptable. Last week, Foreign Secretary Jeremy Hunt said the British government may seek an extension to Article 50 in a bid to secure a deal. Email “Irish government welcomes May's border comments but says she has 'unrealistic expectations' about backstop ”. Feedback on “Irish government welcomes May's border comments but says she has 'unrealistic expectations' about backstop ”.